The move comes as the White House prepares to unveil its new immigration framework Monday, one that offers a pathway to citizenship for up to 1.8 million undocumented "Dreamers" who were brought to the country as children. Washington: Two dozen immigrants who came to the United States illegally will be in attendance Tuesday when President Donald Trump delivers his first State of the Union speech to a joint session of Congress. 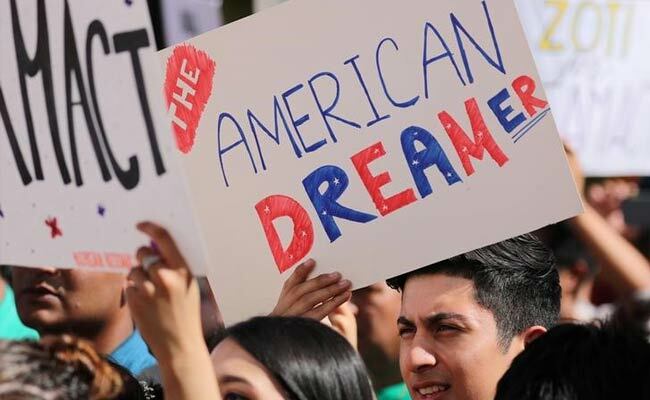 At least 23 Dreamers will be in the public galleries in the House of Representatives chamber as guests of Democratic lawmakers, according to a list provided Friday by a congressional aide. Republican Representative Carlos Curbelo of Florida, a state with a substantial immigrant community, said he too will bring a Dreamer to the speech. House Democrat Scott Peters of California said he was "honored" to have Karen Bahena, who was brought by her parents across the border from Mexico in 2001 when she was eight years old, as his guest to Trump's speech. Bahena, protected by the previous administration's deferred action that is set to expire on March 5 absent a fix by Congress, graduated from San Diego State University and aspires to be a nurse. "Outstanding contributors to society like Karen should not be forced out of our country," Peters said in a statement. "Instead, they should be embraced and celebrated for making the United States a better place." Half a dozen other immigration-related guests will also attend, including congresswoman Debbie Dingell's guest Cindy Garcia, the wife of a father of two who was deported last week. The "Me Too" movement will also be well-represented. At least 10 lawmakers are bringing sexual assault victims or women's rights activists as their guests, according to the list, as the nation experiences a reckoning over sexual misconduct. Some prominent Democratic lawmakers have already said they will boycott the speech. Congressman John Lewis, an American civil rights icon who once marched with Martin Luther King Jr, said he will not attend the January 30 address because Trump used a vulgar slur to describe some countries during a meeting with lawmakers about a possible bipartisan immigration deal. With the March deadline looming, US lawmakers have struggled to find a solution that passes muster with both Democrats and Republicans. "For a permanent fix to our immigration laws, Congress needs to act," US Attorney General Jeff Sessions said Friday in a speech in Virginia. "It is time to end the lawlessness and create a system that serves the national interest."